Jamie Pace (left) tries to launch a Sliema attack during yesterday`s friendly at Corradino. Sliema Wanderers' new signings, Daniel Bogdanovic, Lee Lombardi, Jamie Pace and Dybrill Sylla, all made their debut with the Blues in a friendly match against the Nigerian Stars at the Hibs Ground yesterday. The match was a good test for the Wanderers who are preparing for next week's Champions League first qualifying round tie against FC Skonto of Latvia. The Blues won the match 5-1 with their goals coming from Kevin Sammut (2), Orosco Anonam, Joe Brincat and Rupert Mangion. 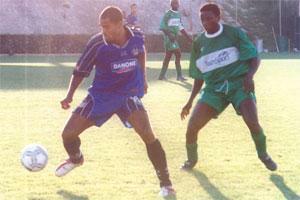 Ndubisi Chukunyere scored for the Nigerian selection.